The sign of a startup household is an un-fully stocked pantry. Our meals are slowly improving though. Our first dinner at home consisted of grilled cheese sandwiches using the Caribbean sandwich maker graciously donated to us. The next night, we had chicken wraps with wasabi mayo also graciously donated to us. When we finally got a stove (a gracious donation), we started having hot meals. The other night, I made a simple pasta dish. Just stewed tomatoes with lots of garlic, onions, and mushrooms. I kept the slices chunky to make the sauce seem meatier. To combat the canned flavors of the rest of the ingredients, I put in lots of fresh cilantro. 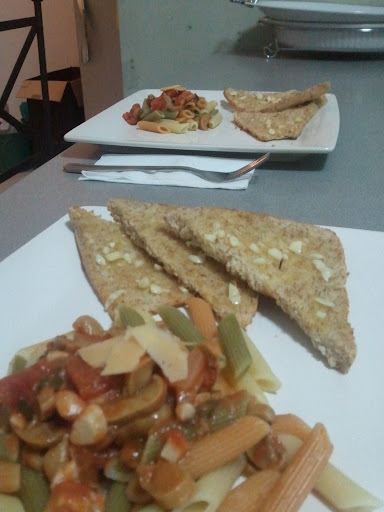 Garlic bread on the side and queso de bola shavings on top and dinner is served. I think I undercooked the sauce a little bit since the tomatoes were still very plump and whole. My husband did not seem to mind.